Famous orator Dr Zakir Naik Sb is not in need of any introduction. Dr. Zakir Naik is known for his discussions and debates on comparative religions. He is a valuable asset of the Ummah. May Allah accept him and give him Long life.(Ameen). 1. He does not care his words while talking on issues of difference of opinion among Scholars. 2. His Knowledge with respect to Quran & Hadith does not remain upto the mark. Many Mistakes he has done while dealing Fiqh issues. 3. Many a time he wrongly alleges some other Muslim organisation directly or indirectly without substance/ Ground information. But this was far from truth. The Hadith for placing hand on chest from Wasil Ibne Hajar (R.A.) in Sahih Ibne Khuzaimah is weak(Zaeef) Hadith. Actually all the Ahadith for position of hand in prayer are weak. Following is Scholary discussion Taken from the book Fiqhal Imam on the Issue ...............................Ibne Qayyim al Jouzi r.a (the student of Imam Ibne Taimiyya R.A) has written in ZADUL MAAD that all the Ahadith for hand positions are Weak (Zaeef).In Abu Daood Shareef it is reported from Hazrat Ali that it is sunnat to place hand below navel. all are from hadith but all hadith are weak. This is the reason that different Imams Based on their Principles of derivation of rule has differed on the issue and it is their Ijtahad and Islam has allowed it. BUT ALL Scholars ARE AGREED THAT other RULINGs AND POSITIONs ARE also CORRECT...........Imam Shafaee opinion is of placing below chest but when he visited Imam Abu Haneefa Place prayed according to Hanafi way of placing below nevel. Comes from a Hadith reported by Imams Bukhari and Muslim, in which Prophet Muhammad (S.A.W.) ordered his companions after the battle of Al-Ahzaab saying, “No one of you should pray Asr until you reach the village of Bani-Qurayzah (A Jewish tribe) .” While they were on their way, the time of Asr came. Some companions said we should not pray until we reach Bani-Qurayzah. Others said we should pray Asr now because the Prophet (S.A.W.) did not mean for us to leave the Asr prayer, but he wanted us to be in a hurry. So some of the companions prayed Asr , while others continued on until they reached Bani-Qurayzah after sunset. When they went back to the Prophet, they mentioned to him the story and he did not blame either one of them." This Hadith clearly shows us that the Prophet Muhammad (S.A.W.) accepted both opinions, because if one of them were wrong then the Prophet would have expressed it at that time. Then HOW Dr. Zakir Naik who himself enter into well of controversy will be spared ???????? 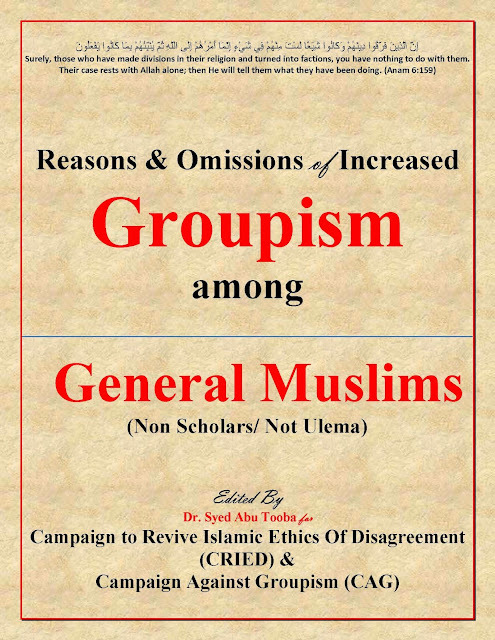 3.It is good for Muslim and for Islamic Dawah that he should come out of Groupism going among the Muslim..............Dr zakir Naik should focus on his field of comparative religion and leave other issues related to the Islamic sciences to the qualified ulema this was the quality of Shaykh Ahmed Deedat (Rahimahullah). 4. All Muslims should co-operate with him for the work he is doing for propagation of Islam. As he accepted on the occasion on inaugral session of Mumbai urdu peace conference about one matter that it is his slip of tongue. It is better that he should come up with clarification on similar issues.Because many people with wrong motives are posting his videos under different headings on You Tube and indirectly taking his name for their malcompaighn. 5. Once he come with clarification on any issue that issue should be buried and should not be raised again. Truly speaking everyone is suffering from this misinformation campaign. May Allah help us.